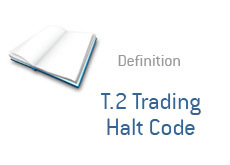 T.2 Trading Halt Code - What Does It Mean? What does it mean if a stock has been halted with a "T.2 Trading Halt" code? Is this a good or a bad thing for people holding shares of the stock? As we've said before, a "T.1" trading halt occurs when a stock is halted, pending the release of news. When a "T.1" trading halt changes into a "T.2" trading halt, this means that the stock is still halted and whatever news that forced the stock to be halted in the first place has started the "dissemination" process. Why not just resume trading in the stock AS SOON as the news is released? They want to give people as many people as possible the opportunity to learn about and digest the news. When the news has been "fully disseminated", the "T.2" trading halt turns into a "T.3" trading halt. We'll cover that at another time. Let's give an example of a situation in which a "T.2" trading halt might take place. Example: XYZ is halted in afterhours trading. Investors hold their collective breath while a "T.1" trading halt code is slapped on the shares of XYZ. A few minutes later, the "T.1" trading halt code turns into a "T.2" code. In this case, XYZ has agreed to be purchased by another company, pending shareholder approval. The news is being disseminated, hence the reason for the T.2 code.